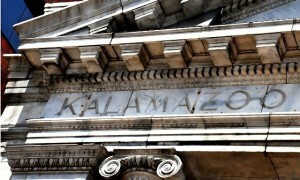 Photo courtesy of Downtown Kalamazoo, Inc. Even a simple stroll through Kalamazoo can be a glimpse into our past and the promise of our future. Several commercial and public buildings in downtown Kalamazoo, including City Hall, possess the crisp geometry and surface ornaments of Art Deco—an eclectic design style born during the Jazz Age. Residental architecture ranges from the prairie style of Frank Lloyd Wright to ornate Victorian mansions in our charming neighborhoods. For a look into the legacy of early automobile invention, take a driving tour through our town. More than twenty different automobiles were built in Kalamazoo and the surrounding areas and many of the factory buildings still survive. Download the Kalamazoo Valley Automobile Heritage brochure and start exploring our automotive history. You can also marvel at the many community based public murals which showcase emerging artists and a vibrant community spirit. Whether by foot or car, these large scale images will take you to special, secret places off the beaten track. If you have a passion for history, we have stories to tell. Click here for more information on tours in Kalamazoo County, we'll help you plan your perfect route.